A raging inferno blazed all around it, but it did not burn. The roof collapsed above it, but it didn’t budge. Thousands of gallons of water poured onto it, but it remained in place. The seven-foot wooden cross in the sanctuary of Community First Church of God in Homeland, California, which stood tall in the midst of piles of charred rubble, has since become a visible reminder of God’s faithfulness. Over the next few months, the church’s nightmare would set into motion a series of developments leading to a stronger, healthier congregation and community. Several hours earlier, however, Pastor Mike Gratzke found himself staring in disbelief at the sickening orange glow that illuminated the night sky. It was Saturday, April 30, 2016. The pastor who had served the church now for seven years slowly gathered his senses and looked up toward heaven. “Lord Jesus, I don’t know how you will be glorified through this, but I know you will,” he cried. Forty-nine emergency workers were on the scene, including several fire engines. This wasn’t the first time the church had been a victim of arson, nor would it be the last. In October 2015, a fire was started at the church but damage was limited. The investigation into the cause was ongoing when the second fire rendered the structure a total loss. Less than three weeks later, the parsonage went up in flames. Thankfully, no one was injured in any of the three blazes, but by the third fire, the congregation was feeling more than a little weary. 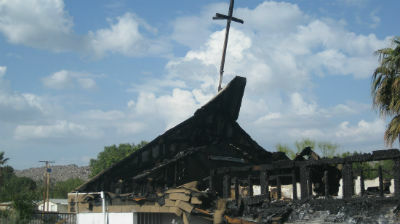 Photo: One of four crosses that remained standing. “We had a feeling that the parsonage fire was kicking us while we were still down,” Mike explains. But that’s when Mike recounts a second miracle. Assessing the damage to the main church building, they discovered in the ashes a Bible resting on the ground, singed on the edges, but otherwise unscathed. It was open to Job 18. “That’s where Job’s friends are essentially kicking him while he’s still down. But after he lost everything, God restored Job and multiplied blessing upon blessing. It was an unexplainable reminder that God was with us through it all, and he will continue to be.” As God gave Job a double blessing in the wake of tragedy, the same came true for Community First. The week of the parsonage fire, the church learned that the insurance company had reappraised the losses of the church and parsonage and doubled their offer. In a three-week period, the community of Homeland was reeling after a total of fourteen fires. The church happened to be the first. The school had a small fire, the Seventh Day Adventist church had a small fire, a few sheds and houses were partially burnt. But the three total losses were the church, the parsonage, and one other mobile home. 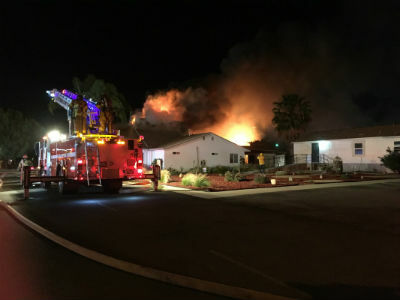 Authorities took the suspect into custody at the location of the fifth fire on May 20. The fires have since stopped. Of all the miracles, however, the greatest is what took place since the fires were extinguished. From southern California to Israel, the support came flooding in. David Winn of the Association of the Church of God in Southern California and Southern Nevada was a towering figure of encouragement from the start. Local congregations rallied around Community First with prayer, financial donations, and donations of church supplies and furnishings, including South Bay Church of God, Willow Street Long Beach Church of God, and Clairemont Church of God. Numerous other churches offered support, including a large church in nearby Riverside, known as The Grove, which pledged to walk with Community First Church of God until the congregation walks into a new building. Photo: The tent the church worship in. It wasn’t just the church community rallying behind them. A local Messianic rabbi with multiple synagogues under his care promised to pray. He also told Mike that, “Four synagogues in Ethiopia are praying for you and will continue to pray. All of our synagogues in Eastern Europe and Scotland are praying for you. Synagogues in Tel Aviv and Jerusalem are praying, too.” With tears forming in his eyes, Pastor Mike said that one synagogue in Jerusalem wrote the name of the church on a piece of paper, along with a prayer in Hebrew, and placed it in the Wailing Wall as they wept and mourned for the loss of the Homeland church. The Islamic Society of Hemet, a nearby city, donated to replace church hymnals. The Interfaith Council of Hemet and San Jacinto sent offerings. The Latter Day Saints sent volunteer workers. Mike was absolutely stunned by the outpouring of love, even from those least expected to do so. 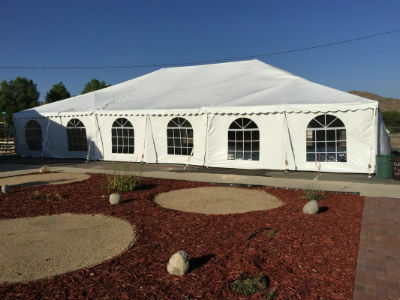 An expansive white tent in the church parking lot has been the gathering place for Community First Church of God for much of this year. But these believers know the church is more than the building. The church’s marquee was updated to read, “My people are the church, and this church is alive. Signed, Jesus.” In addition to the main cross inside the building, three other crosses, including the one on the roof, remained standing. God’s church still stands, too. But the church isn’t the only thing they plan to rebuild. 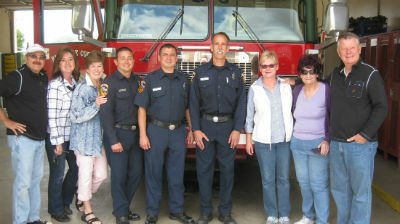 Photo: Pastor Mike (far right), church members express appreciation to the firefighters. Constructing a safe playground, which the community now lacks, is the church’s first step. Because of the fires, the church now has a network of supportive individuals and agencies eager to help them accomplish their goals. From the county government to neighbors who don’t even attend church, the community is coming together like never before to put programs into place that will forever change the trajectory of the children who grow up in Homeland, California. Out of the ashes, both church and community now rise. This entry was posted in All Church of God, Western and tagged arson, burn down, California, community, Community First Church of God, ecumenical, fire, from the ashes, Homeland, inspirational, Mike Gratzke, rebuild, southern CA, support. Bookmark the permalink.